The multi-disciplinary curriculum in Regulatory Science is designed to prepare students for exciting careers related to regulatory and compliance activities with federal, state, and local governments as well as private industry. Governmental regulatory agencies protect the health and safety of the American public. They help to ensure safety in the development, distribution, and use of natural resources, food products, and agriculture. In addition, regulatory agents work with environmental issues, waste disposal methods, and the industrial and manufacturing sectors. Students completing the curriculum have expertise in a technical field as well as broad-based knowledge of the legislative and judicial powers delegated to federal and state agencies. Graduates of the program are equipped to balance regulatory issues of health and safety with constitutional rights of citizens, economic development interest, national security, international development and other evolving social and political priorities. The Regulatory Science Program is offered at both the Pine Bluff and North Little Rock campuses. 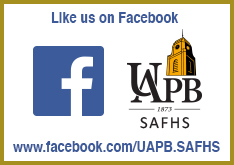 The general education requirements and regulatory science courses can all be taken at either the North Little Rock site or the University of Arkansas at Pine Bluff campus. The program is offered with three options: Agriculture, Environmental Biology and Industrial Health and Safety.